A new line of t-shirts featuring four different Nitro+CHiRAL works. Commemorating the 5 years since the Nitroplus Online Shop opened for business, we're introducing all-new t-shirts featuring works from Nitro+CHiRAL! The DRAMAtical Murder version features an elongated version of the game's emblematic images. Available in standard M-size, and loose L-size. Features thin material for added comfort and slightly deep-cut neck, so you can wear it on its own or in layered looks. Enjoy pairing it with your favorite outfit. Material feels soft and smooth and features just the right amount of stretch, so you'll want to wear it every day. 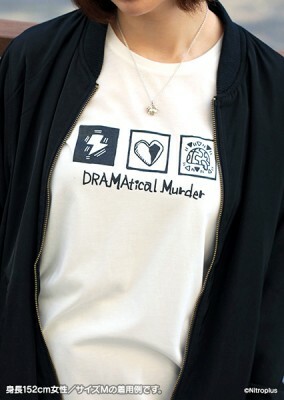 This listing is for the DRAMAtical Murder Original Monochrome T-Shirt in L-Size. ・Quantities are limited. Sales will end once product is sold out.